This is the 5 part in our series on getting the most out of your MxToolbox account. In this installment we will discuss website lookups that help you check your web configuration. HTTP Connect – Checks to ensure that your HTTP server is up and accepting connections. HTTP Filter – HTTP filter provides granular control over HTTP traffic. This check looks for the presence of this filter mechanism. HTTP Delay Check – Checks the delay of an HTTP response. Long delays compromise customer experience. 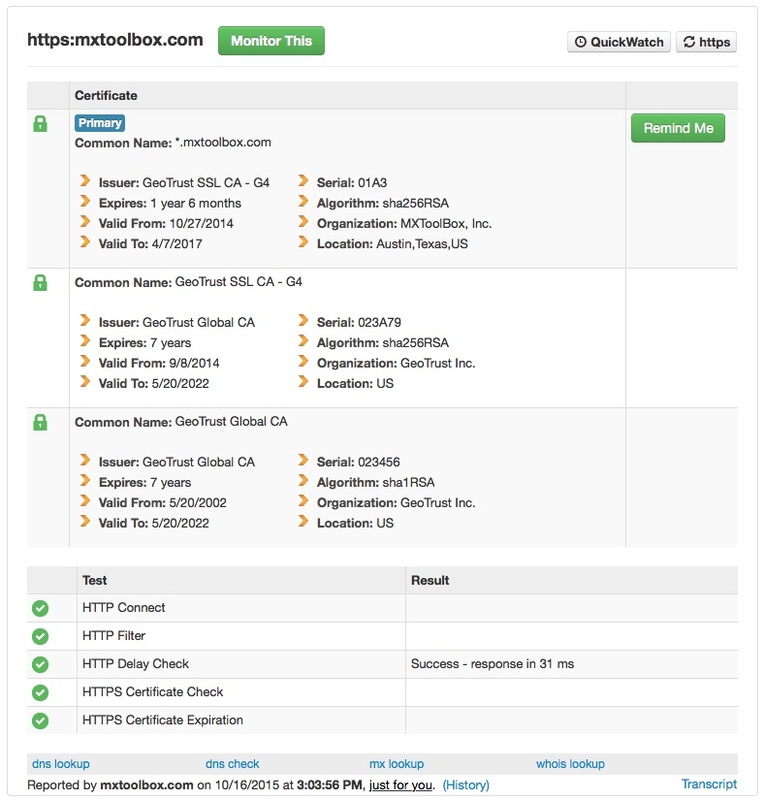 HTTPS Certificate Check – Verifies the secure certificate on your website. HTTPS Certificate Expiration – Checks the secure certificate for expiration dates and warns. Whether you are checking the configuration of an existing web server or setting up a new one, checking the configuration from an external site like MxToolbox is the only way to ensure that you are up and running for your customers. In our next installment, we’ll discuss Domain Health, a comprehensive domain report card. This entry was posted in How to Make the Most of MxToolbox and tagged website on October 25, 2015 by MxToolbox Blog.